National Debt Relief, a financial counseling company specializing in debt relief, receives a best-in-class 5-star rating from TopConsumerReviews.com. National Debt Relief has earned an A+ rating with the Better Business Bureau, and they offer a 100% customer satisfaction guarantee that sets them apart from most other debt relief companies. 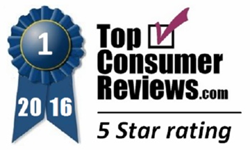 TopConsumerReviews.com has awarded their top five-star rating to National Debt Relief, a financial counseling company specializing in debt relief. As millions of Americans find it increasingly difficult to meet their financial obligations, many people look to debt relief to ease their burdens. From credit card late fees to soaring payment amounts on Adjustable Rate Mortgages (ARMs), it’s easy to see why so many people find themselves in financial trouble and are unsure where to find a solution. While Debt Negotiation, Debt Consolidation, Repayment plans, and Debt Settlement are options available to those who are seeking help regarding their increasing bills, the strategies offered by debt relief companies need to be tailored to the individual’s circumstances. Finding a reputable company with a high degree of customer satisfaction can be a challenge. To find out more about National Debt Relief and other debt relief programs, including reviews and comparison rankings, please visit the Debt Relief category of TopConsumerReviews.com at http://www.topconsumerreviews.com/debt-relief/. National Debt Relief helps customers get of debt, with no fees charged for their services until a debt reduction is achieved. Their experienced debt arbitrators have extensive knowledge of all relevant state and federal laws regarding debt negotiation, as well as established relationships with collection agencies and creditors. The majority of National Debt Relief’s customers are able to become completely debt-free using payment plans that are comfortable for their budgets. TopConsumerReviews.com is a leading provider of independent reviews and rankings of hundreds of consumer products and services. From Debt Relief Programs to Mortgage Refinancing and Credit Repair, TopConsumerReviews.com delivers in-depth product evaluations in order to make your purchasing decision easier.